Or so they say. I wouldn’t know, because I haven’t been outside in two days. Currently, my husband and I are quarantined due to two different ailments, both plague-like and incapacitating. My windows are open, so I can see the sun and feel the breeze. The weather seems to be perfectly springlike, but like I said before, I’m stuck inside, sick. And not just oh-I-feel-yucky sick. No, no, no – I’m why-does-it-hurt-to-wear-clothes-and-why-aren’t-there-more-episodes-of-downton-abbey sick. While watching reruns of the aforementioned Downton Abbey I noticed Daisy, the scullery maid shelling peas. “Peas!” I thought. “What a quintessential spring ingredient! I would love some bright green pea soup with a dollop of creme fraiche right now.” Upon perusing my own kitchen, I was disappointed in my options. Not only was my pantry devoid of a butler, it also had no fresh spring peas. However, I did find dried split peas. I attempted to make a healthy, vegan split pea soup with local carrots and parsnips, but once I realized I had a slab of bacon in the fridge, I got completely sidetracked. Before I knew it, bacon sizzled in the bottom of my soup pot, enhancing the flavor of this smoky soup. How could I resist? In a large soup pot, cook bacon until crisp over medium-high heat. Remove bacon from pot with a slotted spoon and set aside. Drain off some of the fat in the pot, if you wish. Add the onion to the remaining fat and cook until translucent. Add the garlic, onions, celery, and parsnips and cook for four minutes. Add the salt, crushed red pepper, smoked paprika, cumin, marjoram, and bay leaf. Give it a good stir and cook for one minute. Add the stock and split peas. Bring to a boil. 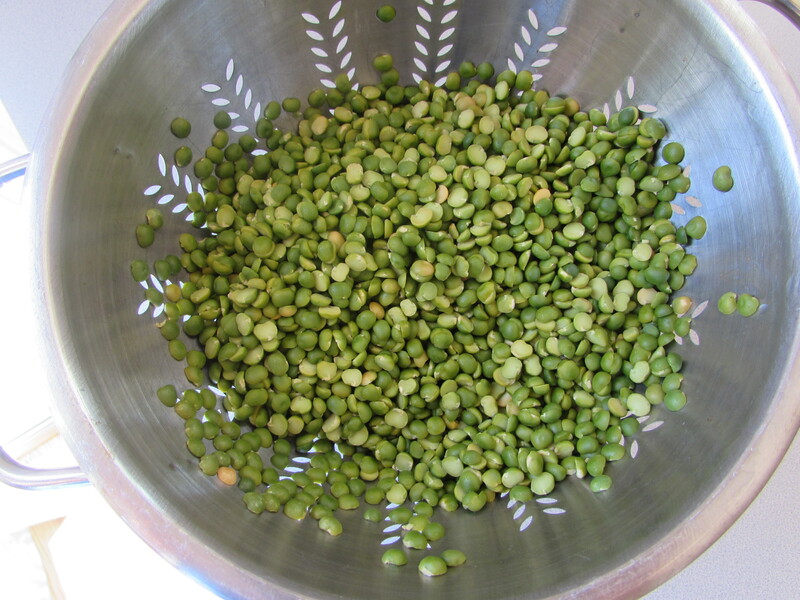 Turn heat to low and simmer for 45 minutes or until the peas are soft. Remove the bay leaf from the soup. Using an immersion blender (this is optional), blend the soup to desired consistency (I like mine thick and a bit chunky). 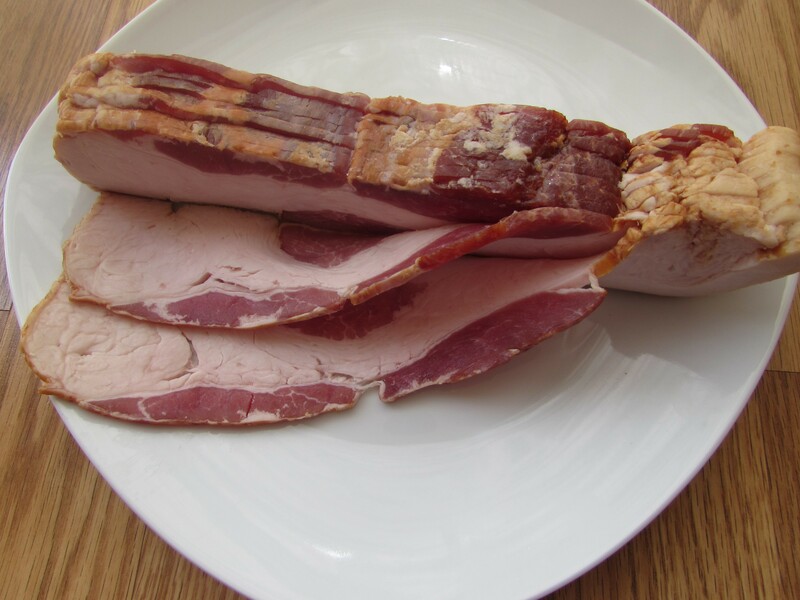 Top with crumbled bacon and serve. 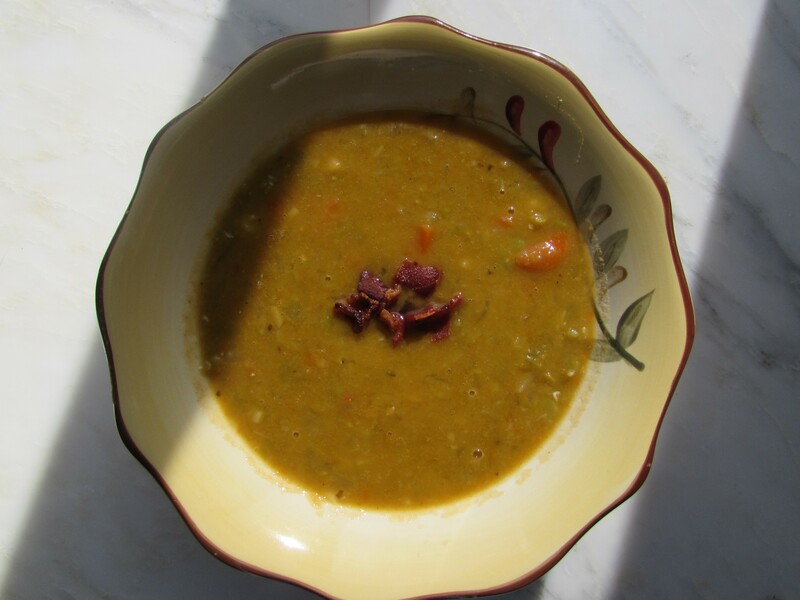 Jim is a huge fan of split pea soup so thanks for this recipe. I made it because Joe loves it. His mom used to make it, so I think it holds some nostalgia for him. I’m trying to feel better, Doctor Darla! I promise I’m on the mend. Drink lots of fluids and rest. That’s what I tell all my patients. This is on my menu for the weekend as the weather is cooling over here. Just looking at that bacon gets me all riled up. I like your style, Nadia – bacon always gets me riled up too. Now I know what’s for dinner on (almost) meatless Monday. Feel better soon!! Thanks, Ellen! A little bacon on meatless Monday never hurt anyone. Normally I would stick a ham bone in there to simmer with the soup, but didn’t have one on hand. I hate to say it but I’m a pig-killer (or at least a pig-eater) through and through. Yes, feel better soon! I was down for the count a couple of weeks ago…. This is the second time this year I’ve been sick enough to watch copious amounts of Netflix. It’s getting old. Why do you always seem to be sick!? I met a German woman one time who told me she was vegan, except for pork. 🙂 I made a nice sweet pea bruschetta the other day, with pureed peas and guanciale. Mmmmmm. Feel better, MFBC. I KNEW you were going to comment on the regular occurrences of my sickness. I almost didn’t go that direction with this post because I’ve already written about being sick so many times! I seem to always make something tasty when I’m sick though, so I guess that’s one positive. Sweet pea bruschetta sounds divine! I can’t wait to get my hands on some fresh peas. I can’t seem to figure out what MFBC means – you’ve stumped me my VCF. I agree – bacon makes everything better. Currently raining and chilly today, but I have high hopes that real spring is on its way. Maybe if you gave them bacon you’d get a better response? Funny how that happens. I made a potato & kale soup last night that quickly became a potato, kale, and bacon soup. Of which I heartily approve. Feel better soon Rachel. It is spring out there, or getting to me. Hope you can get out there and enjoy it! You poor baby! Are you feeling any better? I’m sure your soup is de-licious, even though lentil and split pea soup always look too much like baby-poop for me to actually eat it. Can we just talk about the fact that you were so sick your clothes hurt, but you made soup from scratch with peas that needed to be soaked first? This is why you’re going to succeed in life, Rachey Poo. That and your ability to take simply pornographic pictures of bacon. Pull up a chair, get comfy, and subscribe to my blog via email. Copyright Rachel's Table, 2011 - 2014. All rights reserved. Please do not use text or images without permission or at the very least give me a little link love.